I don't see why that wouldn't work. The only disadvantage is that you have to disconnect the motor and hall sensor cables. Threadlocker can't hurt, but don't expect that to be a savior. It's not always literally loosened nuts. What often happens is the shims get distorted which allows for the axle to move. So you tighten the nuts which applies more pressure against the shims. Sometimes they get so bad that you have to install new shims. Just an FYI. Hopefully in your case tightening will be all that's necessary. Threadlocker can't hurt, but don't expect that to be a savior. It's not always literally loosened nuts. What often happens is the shims get distorted with allows for the axle to move. So you tighten the nuts which applies more pressure against the shims. Sometimes they get so bad that you have to install new shims. Just an FYI. Hopefully in your case tightening will be all that's necessary. I hope so too! I've found aliexpress links to replacement shims, but I'd have to wait a month for China shipping. And of course splitting the shell would be required. If it comes to that, I'd probably check with Jason first before getting them from China though. Thanks for the advice! Some of the Monster guys here in NYC have shoved razor blades to fill the gap on their warped shim FYI. Interesting. Where exactly would you put them? I'm trying to picture it. But I did get 4 hours of sleep last night so I might be missing something obvious, haha. I'm not sure I understand your first paragraph. With either my slotted socket or your new socket, splitting the shell is not necessary. Thanks, I'll keep that offer in mind! The ratchet/socket should arrive on Tuesday or Wednesday of next week, so that'll be the time to see whether just a tightening will suffice. I was saying I'd rather buy this new socket than be forced to split the shell just to tighten the axle nuts, and that I am not looking forward to my first tire change (no way to avoid a split there). I just worded it badly. But I know, until you have, there's always FUD. But rest assured that there's nothing that you can potentially damage in the process. Good luck, and drop a line here when you're done, letting us know the outcome and how you faired. They would go on top of the shims I believe. Well that's good to know. I'll be sure to! Also, I was just watching your ACM -> ACM2 conversion, and you talked about how all the new Gotway wheels have those steel metals plates which attach to the pedal hangers, that are designed to prevent the shims from wearing. How is it possible for the shims to still become deformed with these plates installed? Or do the plates deform with the shims? Oh ok. If all else fails I'll look into that, thanks for the heads up. Regarding the medal plates... I hate to say this, but I've seen two wheels where the metal plates were attached to the pedal hangers with what looks like some kind of adhesive. Adhesive allows items to creep (move when under pressure) I haven't taken apart all of my wheels, but at least the one I used in my conversion wheel was attached with screws. Will be interested in hearing from you if your plates are installed with screws. Wow, facepalm is right. Would I be able to tell without splitting the shell? It looks like they'd screw in separately (with different screws) on the back of the hanger, facing inwards towards the motor. Or if that's not the case, are they screwed in from the front somehow (long screws I guess)? And, unless the screws are somehow recessed, my Monster doesn't seem to have any screws holding the plates on either. Geez, do you think it would be worth it to split the shell just to screw these plates in? It sounds like that would solve the shim problem. Eh, I'll just wait until the tool comes in. If It turns out that tightening doesn't do the trick/if they come loose again, then I'll have to split the shell anyways to replace the shims. I'll properly attach the plates then. Also, it looks like it, but the shims are the same for the Monster and ACM2, right? If I end up getting shims, I'll probably get 2 sets, one for each wheel. I've﻿﻿ decided to go ahead and tighten/threadlock them, but I can't find a 24﻿mm slotted﻿ socket wrench like the one @Marty Backe had made for him﻿﻿﻿. @Marty Backe you should start loaning out the socket or I should make some more. If your worried about getting back the socket just charge a $1000 refundable deposit. I was prepared to provide it to him, but he was going down the path of getting his own and I suspect this won't be the only time he'll be tightening the axle. What is the proper torque for axle bolts on these wheels? I wish we knew. If I were to guess, Gotway probably doesn't use a torque wrench, but I'm guess. 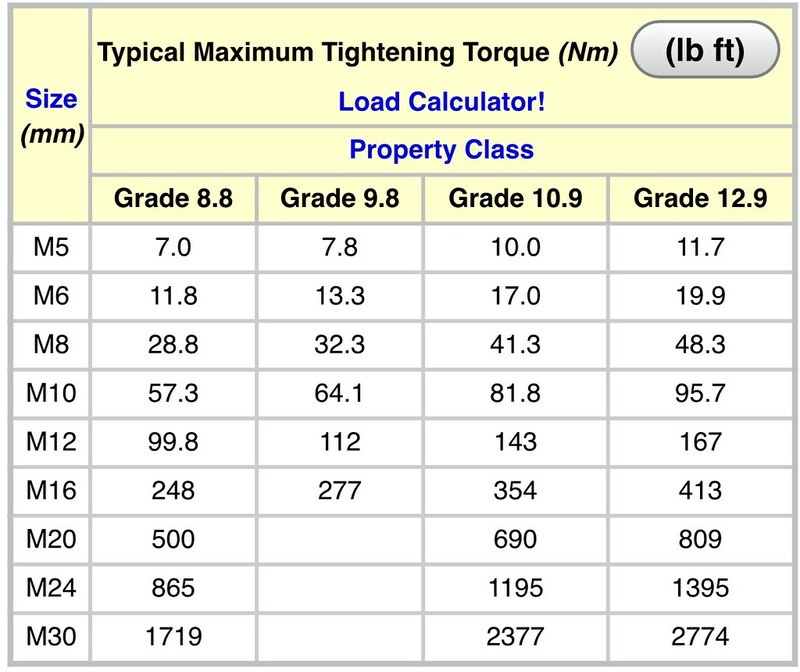 I can’t remember the diameter of my old ACM axle but you can usually find charts that will provide torque specs. Torque for a 24mm (M24) bolt ( axle in this case) ranges from 865 -1395 nm. You then need to take into account that the axle/ shaft is hollow inside which diminishes the amount of torque that can be applied. If you stretch the axle/shaft too much by over torquing the nut you risk attenuating the material. Tight is tight in my book unless GW can elucidate on the exact torque specs. So (865 / magic number) * pleasingConstant should be the right amount of torque then. Yessss. A 24 mm nut fits on a M16 axle. Good point Dancer. Best to measure the diameter of the axle but again take into consideration that the shaft is bored out. I stand by ‘tight is tight’. Like @Marty Backe stated “Gotway probably doesn’t use a torque wrench”. So no Clymer manual for our wheels? I think my mcm5's axle bolt might be loosening. I have a vibration in my pedals that seems to be slowly getting worse. If it’s just the pedals, a magnet may have come loose inside the pedal. You can tell this is the case if, when you tap on the pedal it rattles a bit, and it feels like something is moving around inside. It will be more of a high pitched/tinny rattle. But if the whole body makes a loud vibrating/growling noise when trolleying like mine does, it might be a nut issue. If it's a vibration there's a possibility that the control boards is slightly loose in the shell. Check each screw that holds the control board down and make sure they are tight.